Cindy Kallet and Grey Larsen, each well-known and loved for their decades of music making, have spent well over a decade in a joyful musical collaboration. Cindy is a superb singer, guitarist, songwriter, and multi-instrumentalist. Grey is one of America’s finest players of the Irish flute and tin whistle, as well as an accomplished singer and concertina, fiddle, piano and harmonium player. As composers each contributes to the unique tapestry of contemporary folk and world music as it flourishes in the US today. Together, they weave songs and tunes of vibrant color and rich texture. Their music is remarkable for its vibrant colors and intricate textures, rewarding the listener with a level of nuance and craftsmanship often compared to that of fine chamber music. You may listen to them and view videos for free. The duo’s repertoire includes Cindy’s sparkling original songs, distinctive settings of traditional Irish music, Scandinavian fiddle duets, old-time fiddle and guitar tunes from southern Indiana, and new music that Cindy and Grey are inventing together. There is plenty of variety and breadth of musical territory here, all deeply rooted in folk traditions, and interwoven with the renaissance and baroque counterpoint in which both Cindy and Grey, coincidentally, were immersed while growing up. 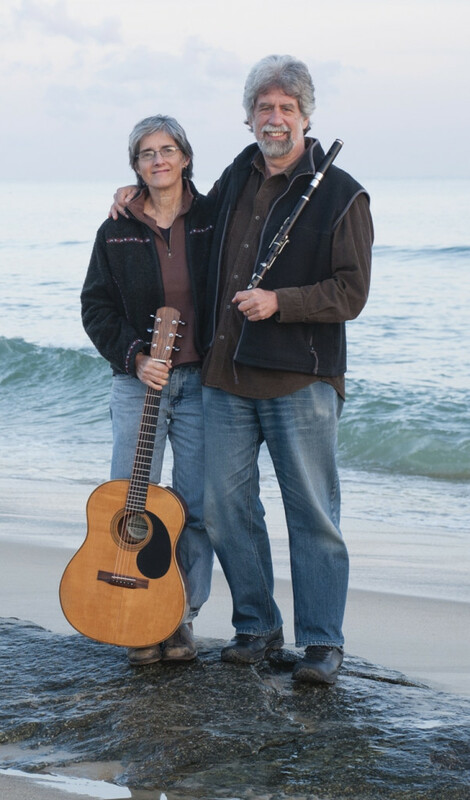 Included are vocal duets, guitar, Irish flute, Irish alto flute, tin whistle, concertina, harmonium, and duet fiddling, and plenty of stories that put the music into a personal context. In 2007, they released their widely-praised first duo recording, Cross the Water. In 2010, they produced a single, and YouTube video, Back When We Were All Machines, a playful, humorous look at the serious subject of our modern paradox of human connection and disconnection. In 2015, they released their second full-length CD, Welcome Day.